Disclaimer: There is a slight chance you may gain 5 lbs. just by reading about this cake, and for that I am sorry. Well…not really because this cake was really, really good! I was asked to make this cake for a Super Bowl party on Sunday, but put my own spin on it. My first thought when seeing the cake was, “What in the world? !” But this is part of the fun, right? So…challenge accepted. I wish I’d take a picture of this beauty with a ruler next to it or something else to demonstrate just how big this cake turned out to be. 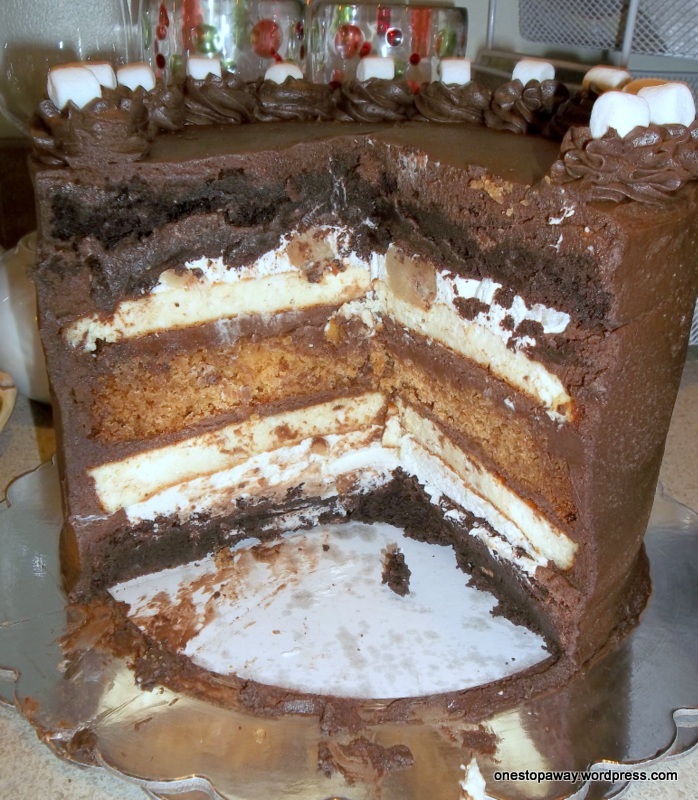 All layers are 9-inch layers, and the cake ended up being about 6-1/4 inches once it was completely iced. This thing was HUGE, and it weighed a ton. Like I said…pure sinful decadence. And completely worth the calorie expenditure. Trust me. Invest in springform pans – good ones. I already had one 9-inch pan, but to save time I bought another one. Just as the original poster suggested, this is what I used to bake the brownies and cheesecakes. I just split the batter between the two pans and voila! 2 perfect 9-inch rounds. Last year I made this vanilla buttercream from Savory Sweet Life and absolutely fell in love. This cake gave me a chance to try out her chocolate buttercream, and boy oh boy it didn’t disappoint. I absolutely loved the idea of including chocolate chip cookie dough instead of baking 9-inch cookies. With this cake I formed the cookie dough into balls and tried folding it into the marshmallow frosting to then spread on the cake. This worked better in theory than in actual execution. Next time though I would actually roll out the dough into a 9-inch disc and include it as its own layer. I used the original poster’s suggestion to try King Arthur Flour’s brownie recipe. It was just as good as she said it was; however next time I would use my own favorite brownie recipe. I don’t think it would be as dense. 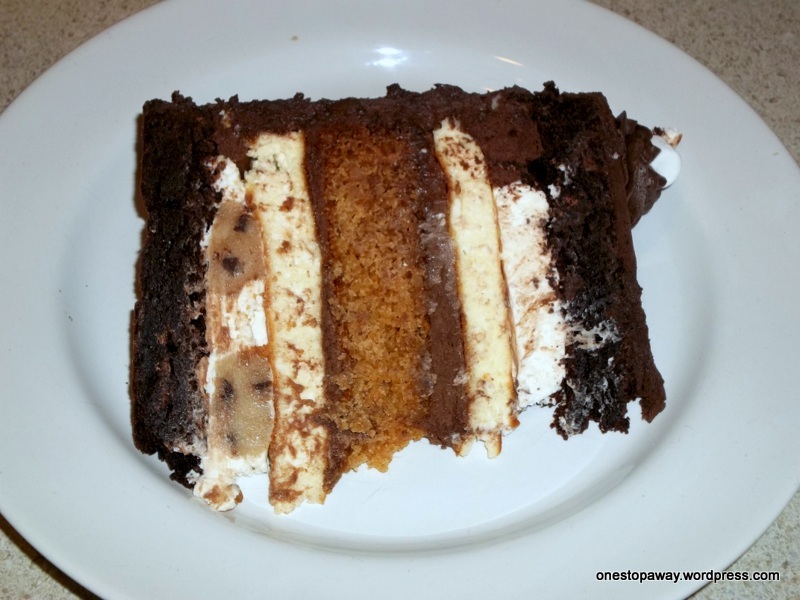 It was the brownie layers that gave me the most trouble when trying to cut through the cake. Preheat the oven to 350 degrees. Lightly grease your pan, put a layer of wax paper or parchment paper down and then spray it again. Baker’s Joy or Wilton’s Bake Easy work great. In a saucepan melt the butter over low heat. Add the sugar and stir to combine. Continue to heat briefly, just until the mixture is hot, but not bubbling. It’ll become shiny looking as you stir it. While the sugar is heating again, crack the 4 eggs into a bowl and beat them with the cocoa, salt, baking powder, coffee powder and vanilla until smooth. Add the hot butter/sugar mixture, stirring until smooth. Then add the flour and chocolate chips, stirring until smooth. Bake the brownie for about 30 minutes, until a cake tester inserted into the center comes out clean. The brownies should feel set on the edges, and the center should look very moist but on uncooked. Remove them from the oven and cool on a rack. From what I can tell most marshmallow frosting recipes are the same. What’s listed below is this recipe, but cut in half. It was Fan.Tas.Tic. Beat in 1/4 of the sugar mixture, then repeat with the remaining sugar. This is an eggless recipe that I found over on Cupcake Project. Do you realize what this means? It’s safe to eat whenever you want, all day long. Stir it in your ice cream or just eat it out of a bowl. It’s that good. Mix all ingredients in a bowl. I know…that was really hard. What I did at this point was use a small cookie scoop and scoop out cookie dough balls, placed them on a cookie sheet and popped them in the fridge. I hope this wasn’t some super secret family recipe, but this is my grandma’s recipe. Well part of it anyway since this is the crustless version. I hope you enjoy it as much as we do. Prepare a 9-inch springform pan. Spray it with non-stick spray and line it with wax paper or parchment paper, and then spray it again. Beat eggs until light and foamy, gradually beat in sugar and beat until light. Beat in salt, sour cream, cream cheese and flour. Pour into a pan and bake for 1 hour at 350 degrees. Turn off the heat, open the oven door and let stand in the oven for another hour. Even if you don’t make this cake you NEED to make this icing. Seriously. I had to triple this recipe to have enough for the filling and icing. Cream butter fora few minutes in a mixer with the paddle attachment on medium speed. Turn off the mixer. Sift 3 cups powdered sugar and cocoa into the mixing bowl. Turn your mixer on the lowest speed (so the dry ingredients do not blow everywhere) until the sugar and cocoa are absorbed by the butter. Increase mixer speed to medium and add vanilla extract, salt, and milk/cream and beat for 3 minutes. If your frosting needs a more stiff consistency, add a little more sugar. If your frosting needs to be thinned out, add additional milk 1 tablespoon at a time. I found this beauty on the New York Times site. Put the graham crackers in a brown paper bag, and smash them up. Squish and pound vigorously. Sitting on the bag insures very fine crumbs. You should end up with about 2 cups. Melt the butter in a large pan over low heat. Stir the eggs and honey in a bowl with the melted butter. In another bowl mix the graham cracker crumbs, baking powder, baking soda and salt. Pour half the graham cracker mixture into the honey mixture and stir well. Add the milk to the honey mixture, and stir again. Add the rest of the crumbs, and mix well. Grease a 9-inch springform pan or round cake pan and pour in the batter. Bake for 20 minutes or until the cake is nicely browned. Place one layer of brownie on a cake plate or stand. I tossed some cookie dough balls into the marshmallow frosting and tried to then spread this on top of the brownie. This didn’t work very well, so I took all the balls out of the marshmallow, spread the buttercream and placed the cookie dough on the marshmallow. Place one layer of cheesecake on top of the marshmallow/cookie dough. Next up is the chocolate buttercream followed by the graham cracker cake. Now we’re just reversing everything. Spread another layer of chocolate buttercream on top of the graham cracker cake. Next is the 2nd layer of cheesecake followed by another layer of marshmallow/cookie dough. 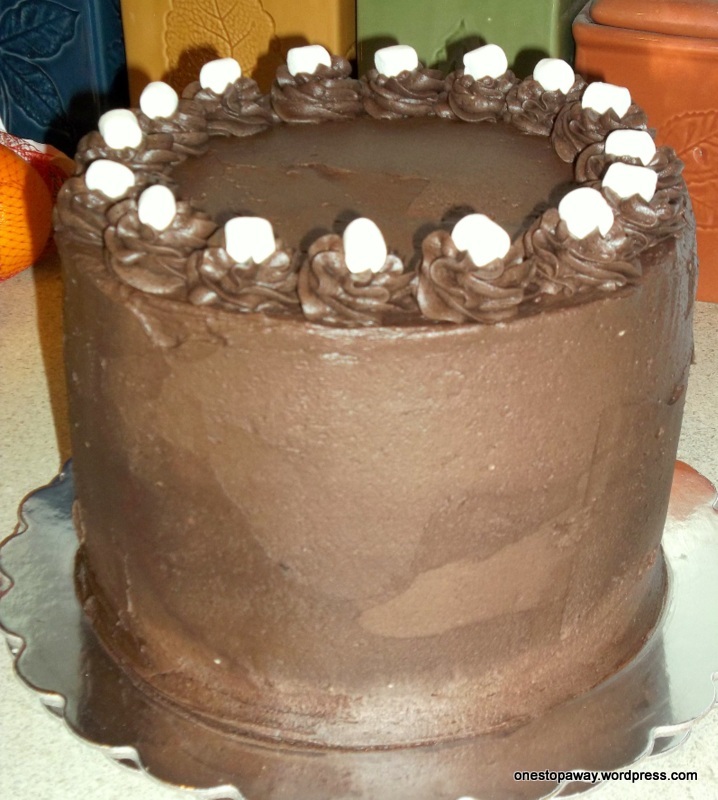 Top it off with the 2nd layer of brownie and frost top and sides with remaining chocolate buttercream. Keep it refrigerated until you’re ready to serve, but you’ll want to set it out at least an hour before you want to cut into it. All the butter and cheesecake and brownie goodness really firms up in the fridge. You’ll need a big knife and a strong arm to cut through this beast, but you will enjoy every. single. bite. Go ahead…you’ve earned it. If you make this come back and let me know. I’d love to hear from you! Wow, I am REALLY impressed!!!!! And I LOVE that you used chocolate chip cookie dough. I might have to remake this for valentine’s day with the cookie dough, my husband would DIE of delight!!!! It was delicious, Jen!!! And Dave looked like he enjoyed it just as much day 2!! Did you guys take some home? I’ve got more here if you want it! Yeah I’ve gained 5 lbs!